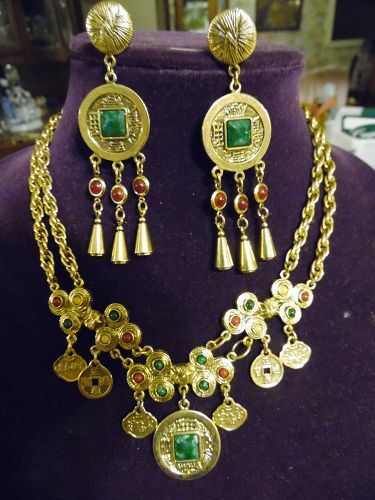 Beautiful antiqued gold tone necklace with matching clip back dangle earrings. Medallions are replicas of middle east coins. Set with cut faux jade and carnelion, and other stones. Substantial weight and quality made. Appears to ever have been worn. Pristine condition. Earrings are just over 3" long, and necklace will fit a 17" neck. An amazing set.